Final results for the Copper Classic. Art Pollard won the two day event with Eldon Rasmussen second. The picture of Art (below) is from a couple years later. 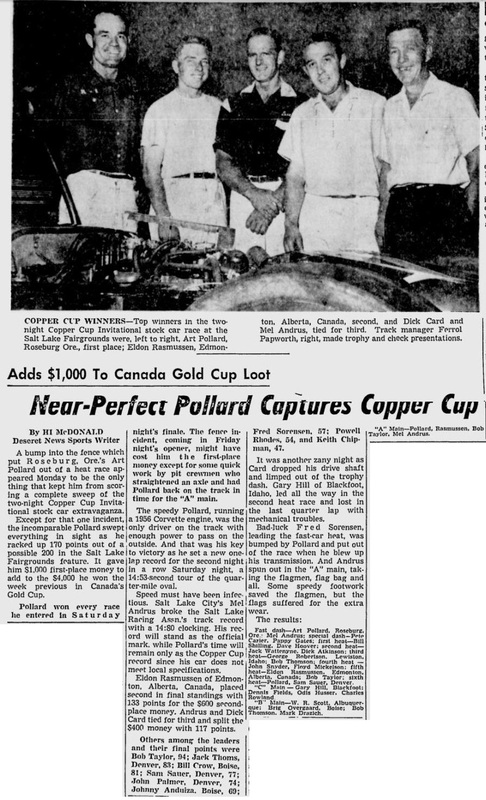 The Copper Cup was a big race at the Salt Lake City Fairgrounds for a number of years. By 1963 it was part of the CAMRA circuit. But even back in 1961 drivers were coming from far and wide to vie for the big prize money. Some results that include Calgary's own George LeMay. George is also in the Canadian Motorsport Hall of Fame. 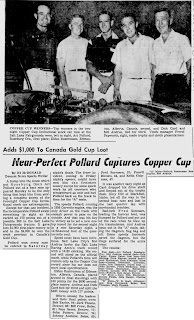 Some 1950 Calgary Herald clippings on the IMCA race in Calgary. 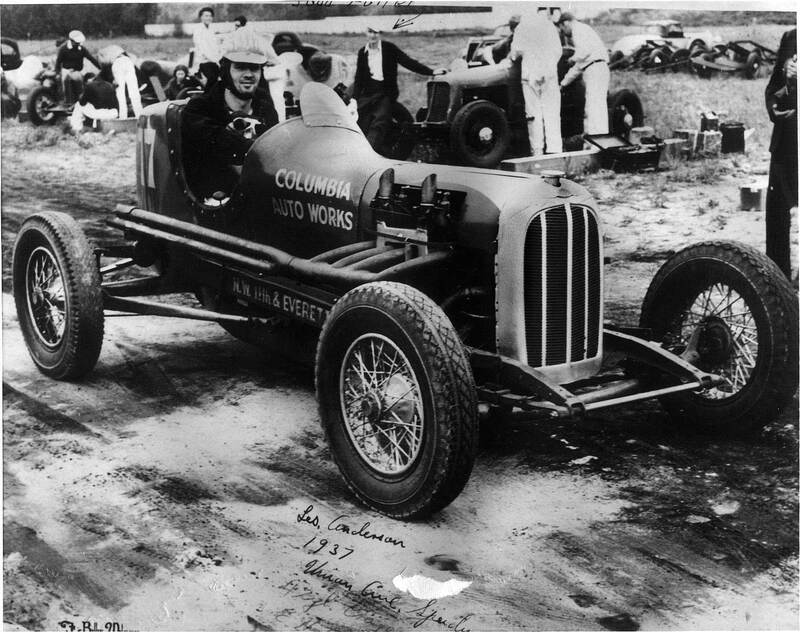 It was Emory Collins' last year racing. I don't think I've put this Jack Smith clipping up. Found it on the net. Finding information on Jack's early days in Alberta is like finding the proverbial needle in a haystack. After he got to Victoria he became very well known. And that is the reason why he is in the Canadian Motorsport Hall of Fame. Because I haven't added any for a long time. Hopefully this is the updated version I worked on recently. I'd added incorrectly in a previous draft. And that upset Pike Green immensely. He wasn't happy being behind Vern Bruce, a guy he couldn't get along with way back when. He was much happier having more wins when I did a recount. 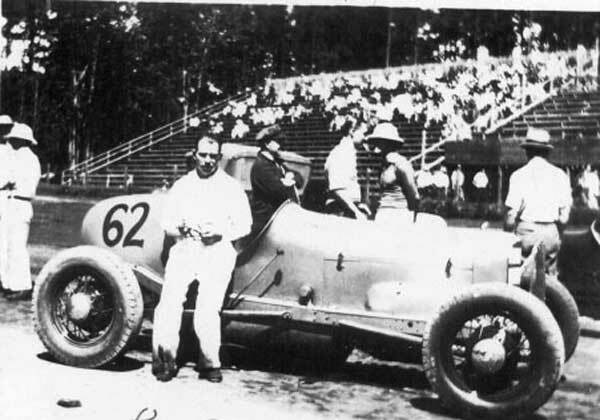 At the end of the 1950 season, the property the held Langford Speedway was sold to the local school board, thus ending eleven seasons of big car racing. The big cars would return to the Victoria area, but it would take a detour north before then. And all of that will be covered shortly. --fast time: Ernie Spalding, ?? The penultimate season for Langford Speedway. --fast time: Harry Brown, ?? --fast time, Jack Spalding, ?? --fast time: Vern Bruce, ?? --fast time: George Simpson, ?? Second post-World War Two season at Langford Speedway. --fast time: Howard Stanley, ?? --fast time: Ken McMurray, ?? --fast time: Del Fanning, ?? 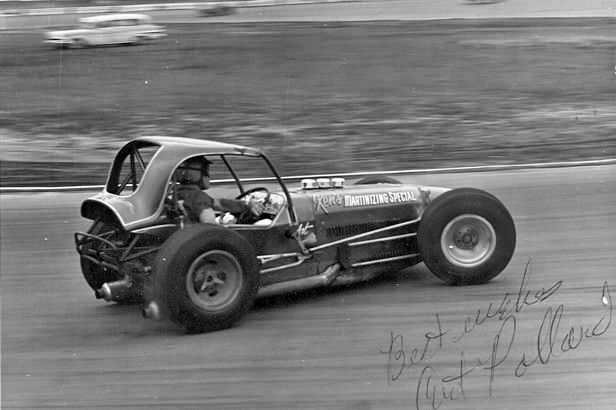 --fast time: Digger Caldwell, ?? --Chuck House, Seattle, owner of car No. 25, was presented with a club bag from the BCASA for his untiring efforts on behalf of the sport. Some more winners, this time from the post-World War Two era. 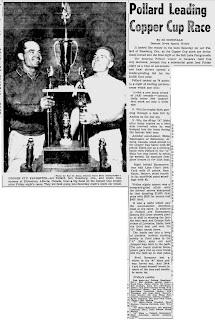 Digger Caldwell also won the Laird Trophy for most wins in the helmet dash. 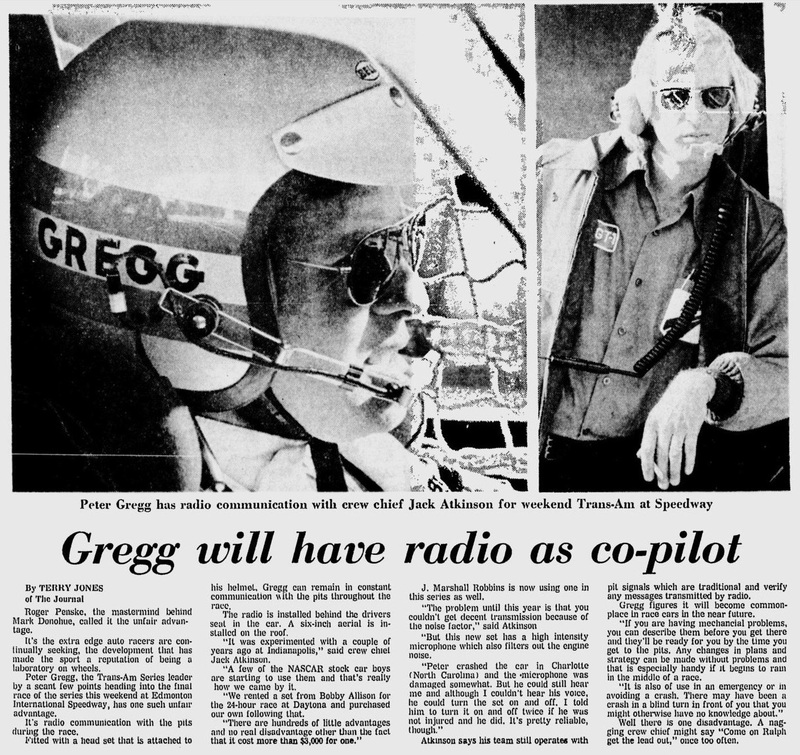 Peter Gregg was second at Edmonton's 1973 Can-Am. 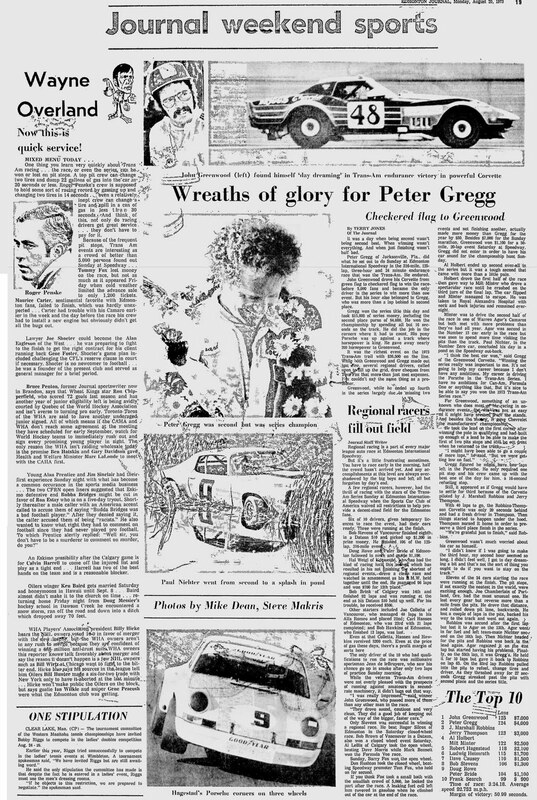 John Greenwood, in a Corvette, won the race. 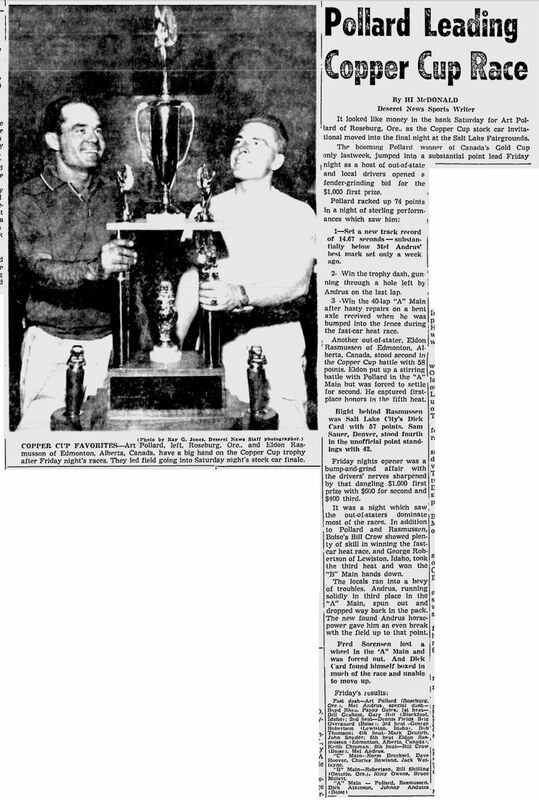 Also, a follow up story on Milt Minter's injuries. 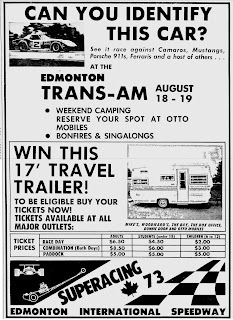 Some more Edmonton Trans-Am clippings. 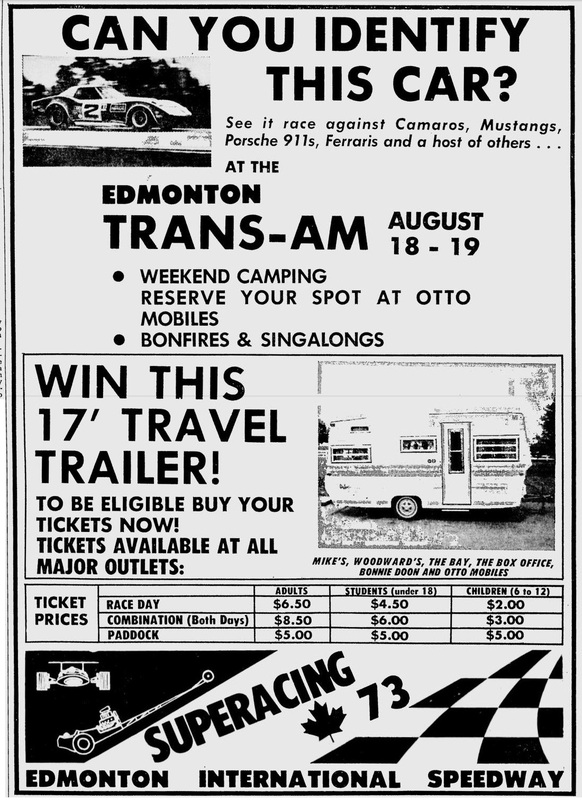 Some clippings from the Edmonton Trans-Am race of 1973. My back and neck have allowed me more time at the computer screen. Never sure if that's a good thing or not. 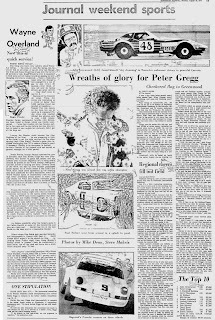 But here I am and have gone through some months (or as much of those months that were available) from the newspaper archive online. 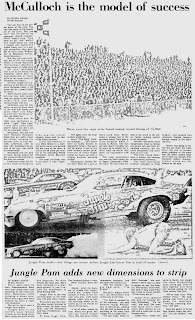 First one, to get your attention, is a big funny car show in Edmonton from 1973. The final featured Ed "the Ace" McColloch and "Jungle" Jim Leiberman. And "Jungle" Pam was there as well, probably more of a draw than the racers. She provided the vital statistics. More Pam can be found here and here. I don't think Jim or Pam made it to Mission. But I could be wrong there. Last season before the Second World War took over. Photos are from the Golden Wheels collection. Whoo-hoo! 1000 posts! Didn't think I'd make it. And here's 1940 from Langford Speedway. More of the local drivers were enlisted and the track relied on American cars coming up. The track was a happening place as the years went by, even if the season ended with war against Germany being declared. Third year of the speedway 8 miles north of Victoria. --fast time: Swede Lindskog, ? Sutton won the Burdie’s Cafe Cup symbolic of the 1938 championship. Second pile of info I have on the big car races at Langford Speedway. This time 1937. 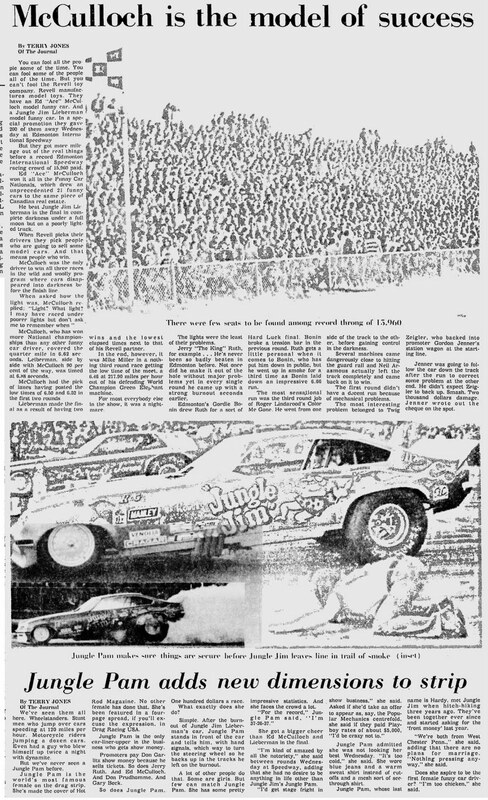 Some old stats I have about Vancouver Island's Langford Speedway.